On the 30 of September, MD Governor O'Malley received an award from University of Maryland Center for Environmental Science. Outside, Calvert County residents and local environmental activists presented a lookalike with a different award. He got a golden pillow for sleeping on the job, at least that part concerning environmental protection. For all that fluffy pillow talk of loving the Earth, O'Malley is the governor who approved the ICC highway in MD, and many fear he will do the same for Dominion's proposal to export fracked gas from Cove Point. 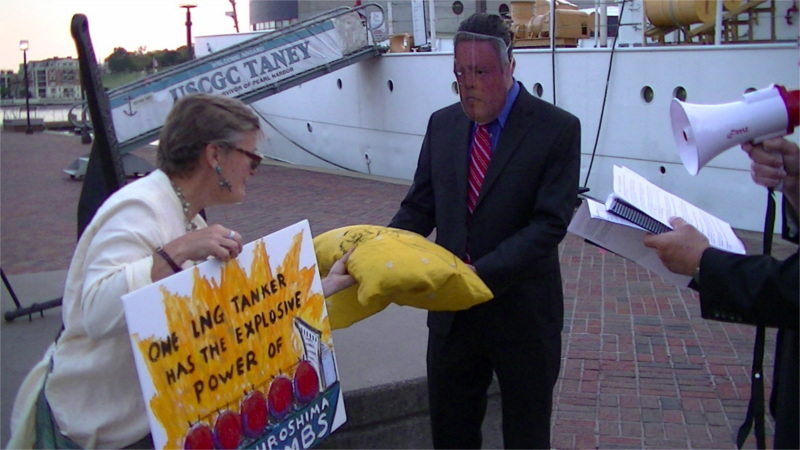 "O'Malley" gettting the golden pillow for sleeping on the job of protecting Calvert County from Dominion Resources's proposal to export fracked gas out of Cove Point on the Bay. 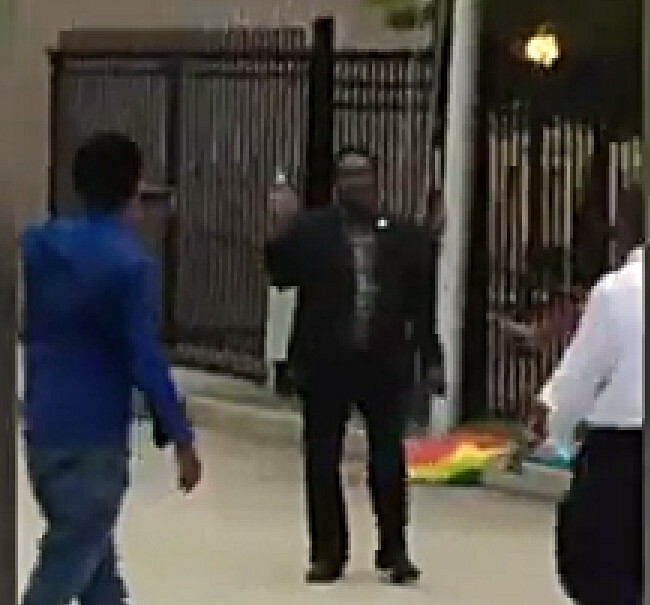 On the 29th of September, a security guard at the Embassy of Ethiopia fired one shot from his sidearm at protesters opposing the current government of Ethiopia who appeared to have succeeded in entering the Embassy courtyard. 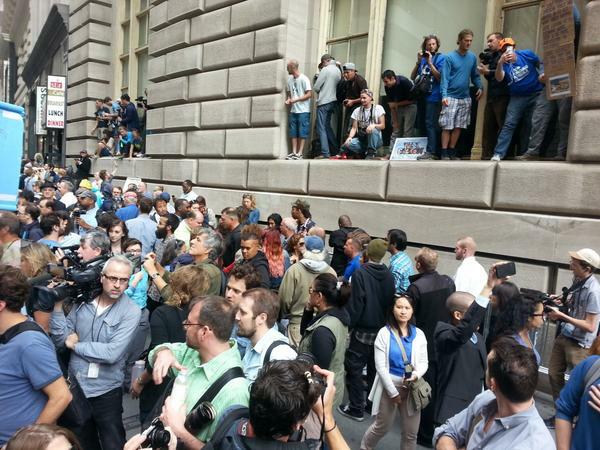 Secret Service arrested the security guard, fortunately his bullet missed all the protesters. It did smash a window in a bystander's car. Still cropped from the Youtube video. The gun in in the right hand of the man wearing the black suit. When it was fired the camera was pointing too low. Thankfully the gun was also pointed in an ineffective direction when it was fired! 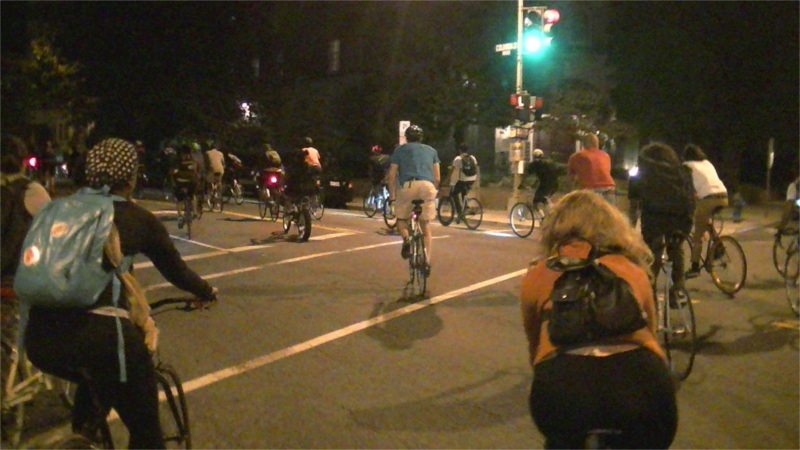 On the 26th of September at least 50 riders took part in DC's monthly Critical Mass bike ride. These rides depart from Dupont Circle shortly after 8PM on the last Friday of every month. The NFL found itself in the crosshairs of "South Park" on Wednesday night, and nobody got out unscathed. TheWashington Redskins' racially-tinged nickname, Dan Snyder's tone-deaf public persona, Roger Goodell's non-answers, Ray Rice, Jerry Jones ... everything was a target. 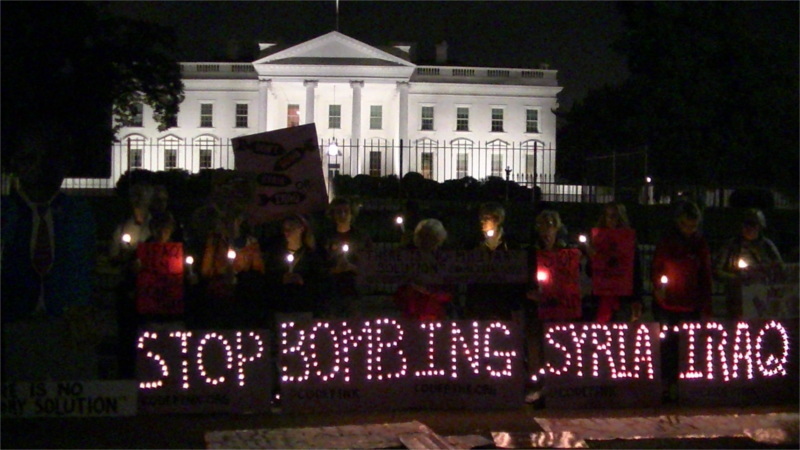 On the 25th of September, Code Pink and ANSWER protested at the White House against Obama's newly intensified bombing of Syria and Iraq. The first protest was at noon, undeterred by rain. 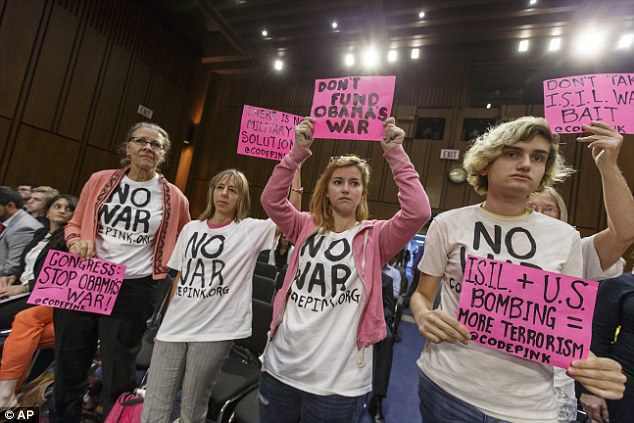 The second was at 7PM, when Code Pink demanded that Obama return his Nobel Peace Prize due to his warmongering. 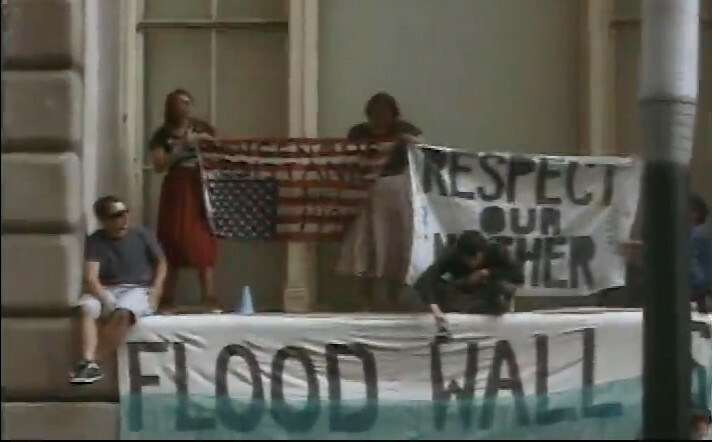 On the 23ed of September, two groups in DC staged direct action solidarity protests with the events in NYC over climate change. 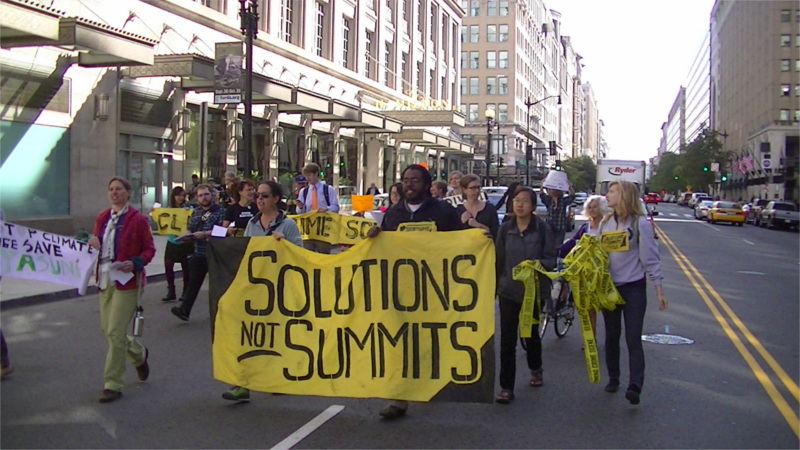 Rising Tide DC marched through the streets staging blockades in front of corporate polluters. Meanwhile, the National Campaign for Nonviolent Resistance blockaded the White House entrance nearest the Oval Office.Five were arrested in the NCNR protest. 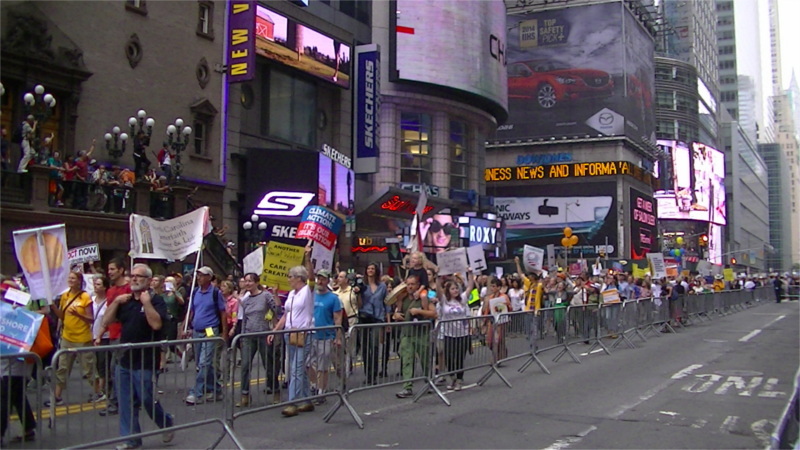 Sun, Sep 21-4PM:Marchers who have exited march swarming back up 37th st, meanwhile marchers are still coming as far as the eye can see. 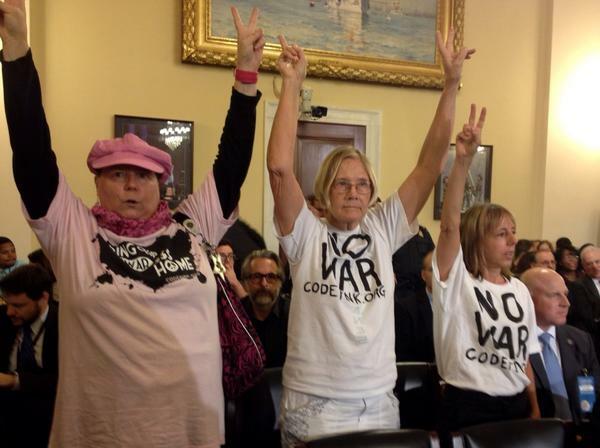 On the 17th of September, Code Pink disrupted their second Congressional war hearing in a row. This time it was the House Homeland Security Committee Hearing on " Worldwide Threats to the Homeland," and Code Pink warned that more US intervention would be "counterproductive." In the previous day's hearing Code Pink warned Congress not to take "war bait" from ISIS/ISIL, suspected by some to be using a strategy that actually requires US intervention to work.